The popularity of AFL in New South Wales and the Australian Capital Territory continues to rise with AFL NSW/ACT today announcing Club participation grew 8.2%. This comes off the back of a phenomenal 78% increase in the number of female participants playing in registered Club football competitions across the state and territory. 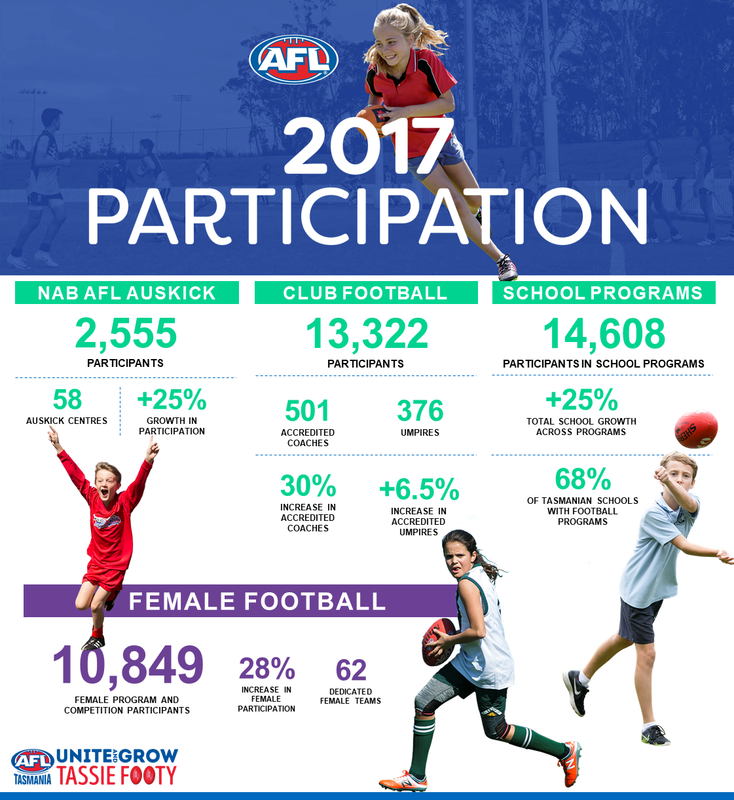 Overall, participation in AFL competitions and programs across the region grew 7.3% in 2017 to over 250,000 participants. 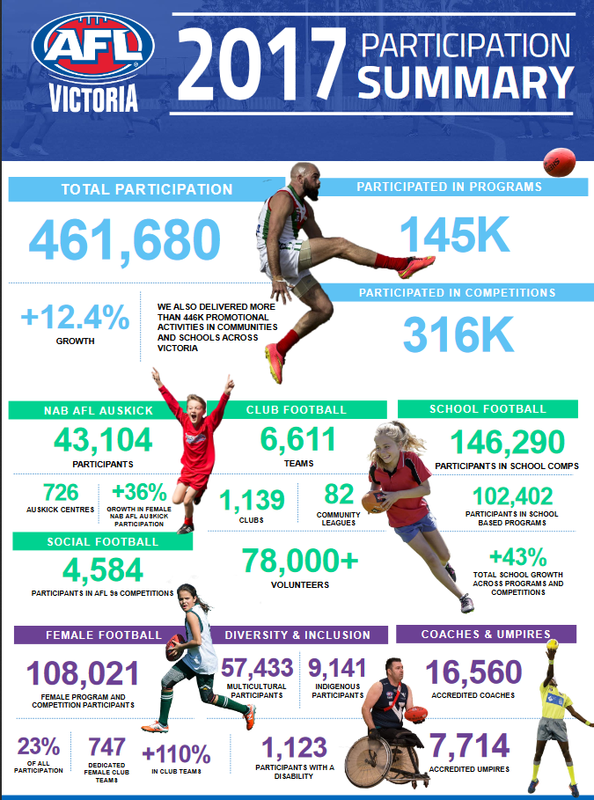 This makes the AFL community in New South Wales and the ACT, Australia’s third largest participation base in the country behind Victoria and Western Australia. 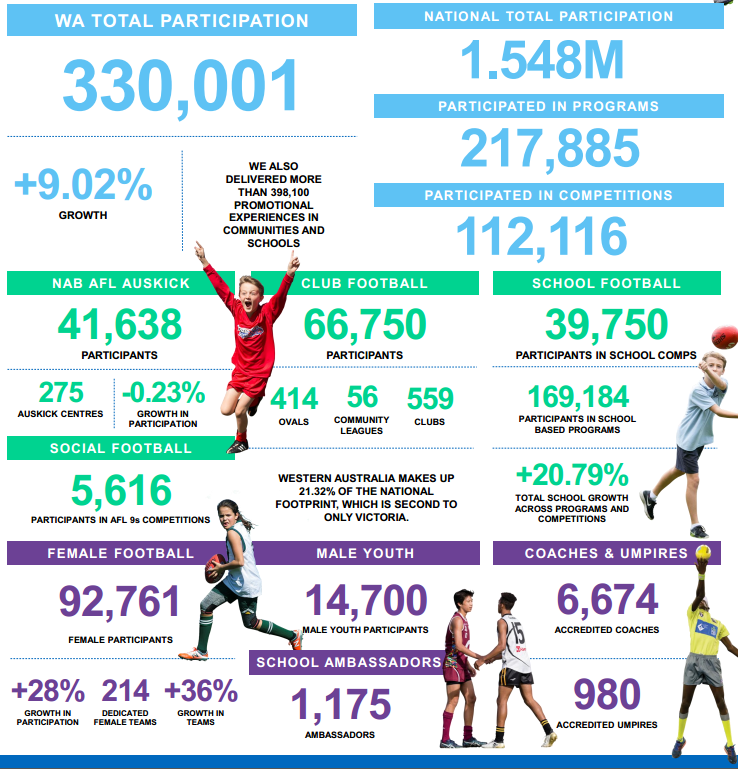 AFL NSW/ACT continues to see rapid growth in the AFL 9s product with a 30% increase in participation in AFL’s official modified, non-contact version of AFL. The fun, fast, free-flowing football is played with nine players per side on a smaller ground. NAB AFL Auskick growth remains steady with over 66,000 Auskickers taking the field this year, representing a 9.3% increase on 2016 with key markets such as Greater Western Sydney seeing double-digit growth in the AFL’s marquee kids participatory offering. 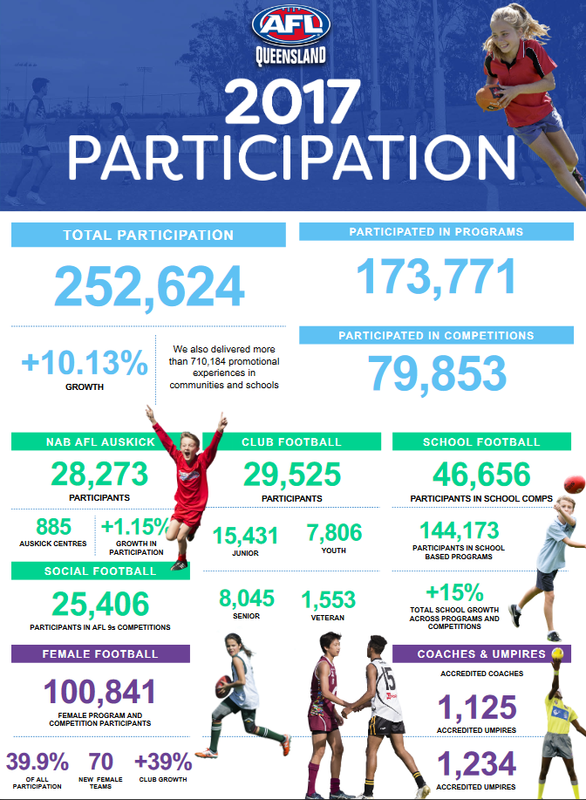 Overall participation in AFL competitions and programs nationwide grew to an impressive 1.55M participants across the country in 2017. 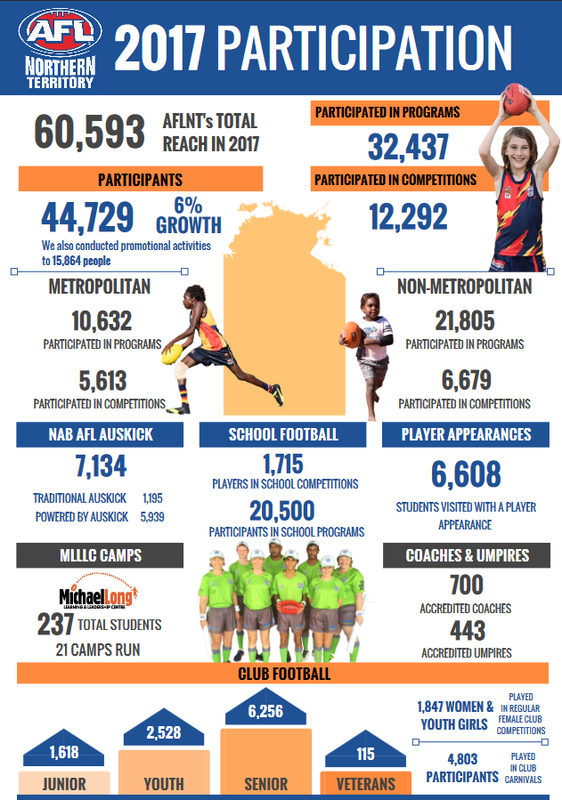 South Australia has once again reinforced its status as a heartland of Australian Rules football, with latest participation figures showing continued strong growth across all levels of the game. A 23% jump in the number participating in school programs to 102,548. 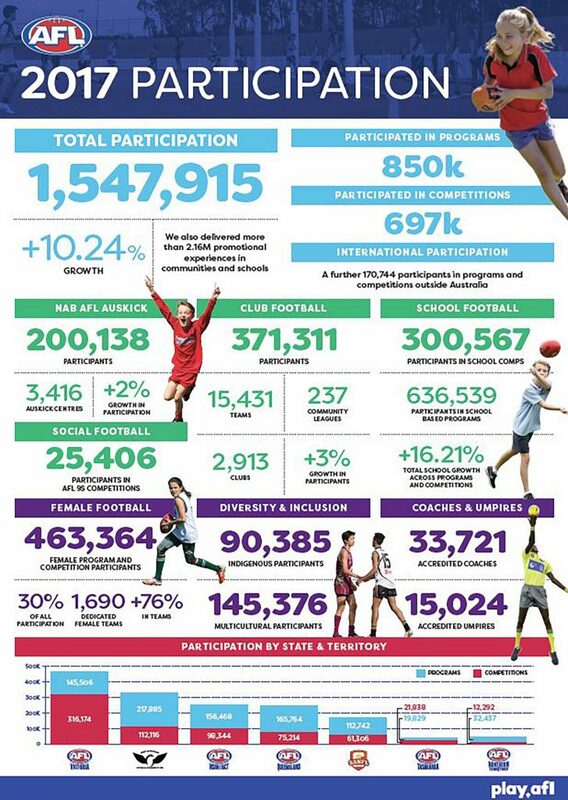 Critically, the total number of players registered in all club and school competitions grew almost five per-cent to 61,306.